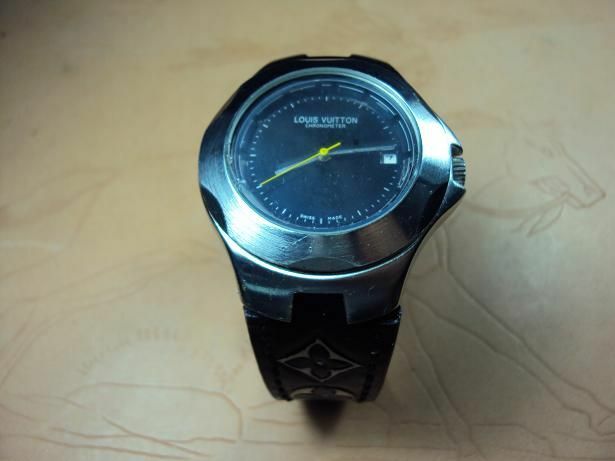 TimeZone : Sales Corner » FS:SVW251~269 custom straps include 13 croco straps, AP,Breguet, IWC, Breitiling,OMEGA,RXW,SEIKO. 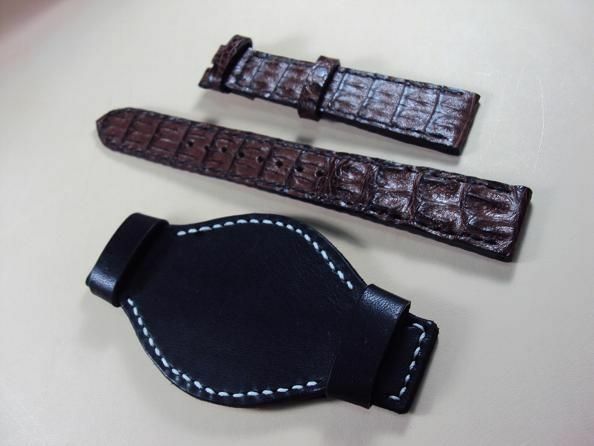 Here are some custom straps of various brand watches SVW251~269 include Audemars Piguet, Breguet, IWC, Breitiling Bigcase Chronograph bund style little horn croco strap, Callaway CY-2085, Carl F. Bucherer, IWC Big Enginieur Chronograph, LV, OMEGA, RXW, SEIKO custom straps. 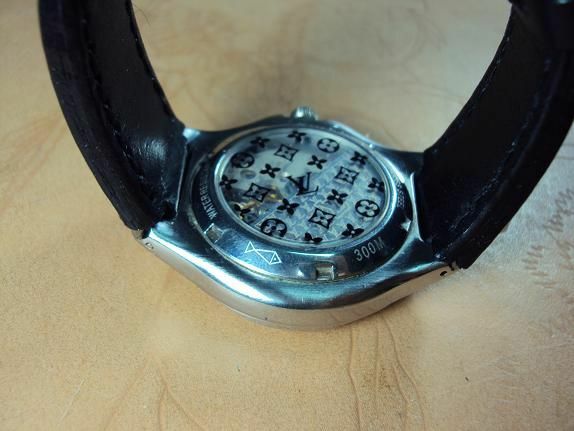 Svw251, 1968 Breitiling Bigcase Chronograph deployant clasp bund style little horn crocodile strap, 22x18mm, 95x150mm, black stitch. 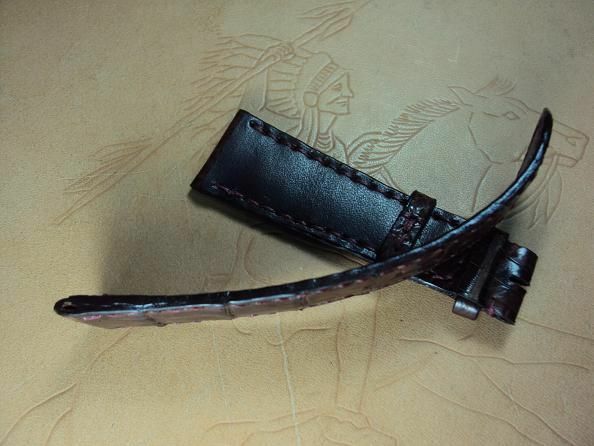 black cowskin bund style. The bund style little horn crocodile strap is priced at $ 280 USD,now charges the promotional price at $ 200 USD. Shipping for worldwide Express Mail Service please plus extra $ 24 USD. 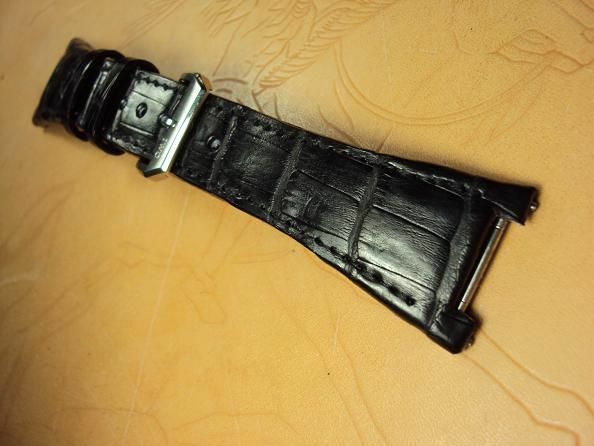 Svw252, Audemars Piguet black padded crocodile strap, 22x16mm, 75x115mm, black stitch. 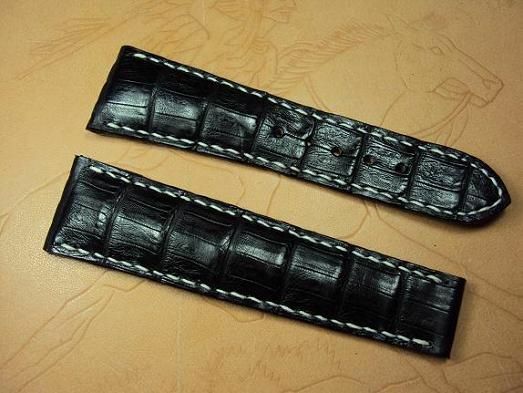 The padded croco belly strap is priced at $ 200 USD, now charges the promotional price at $ 150 USD. Shipping for worldwide Express Mail Service please plus extra $ 24 USD. 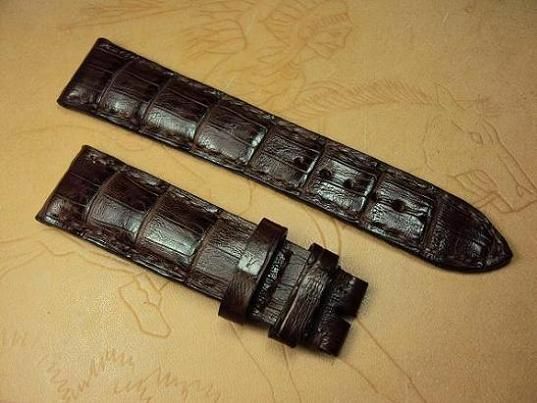 Svw253, Audemars Piguet dark brown padded crocodile strap, 22x16mm, 75x115mm, dark red stitch. 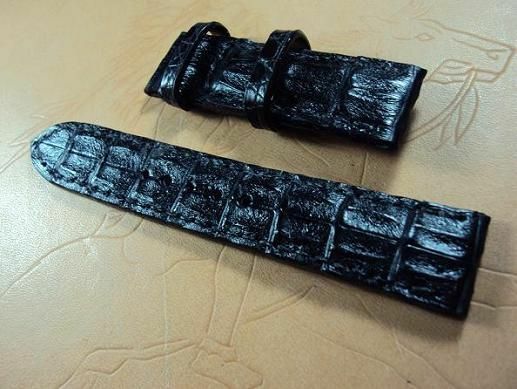 The paddied crocodile belly strap is priced at $ 200 USD, now charges the promotional price at $ 150 USD. Shipping for worldwide Express Mail Service please plus extra $ 24 USD. 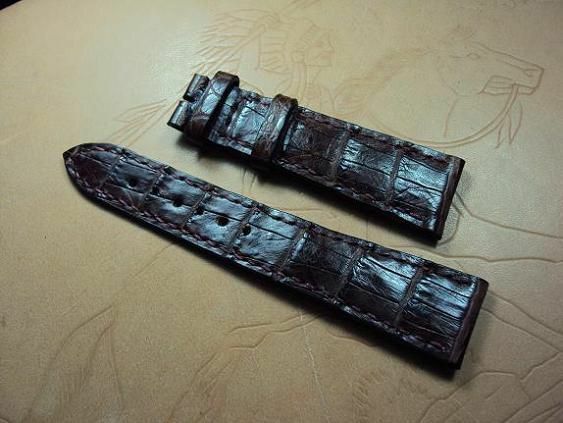 Svw254, Breguet deployant clasp dark brown padded crocodile strap, 20x16mm, 112x72mm, dark brown stitch. 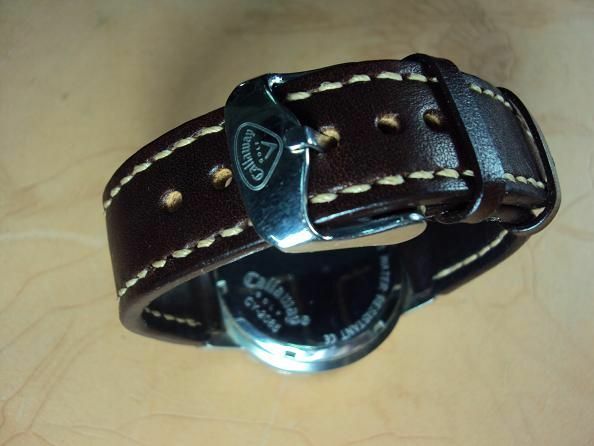 Svw255, Callaway CY-2085 dark brown leather strap, 23x20mm, 75x125mm, thick 6.0mm taper to 3.0mm, cream stitch. 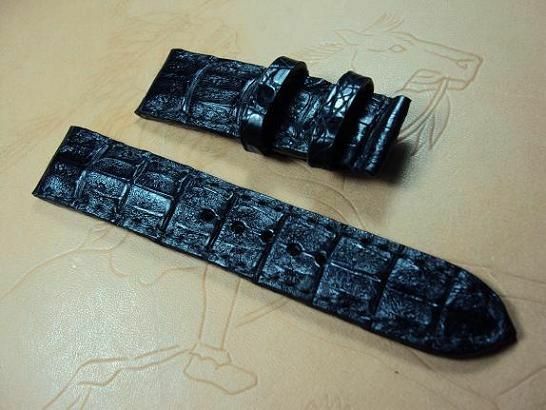 Please notice that this Callaway CY-2085 custom strap service is limited either for sending me the Callaway CY-2085 old strap that has worn to produce the new custom strap. 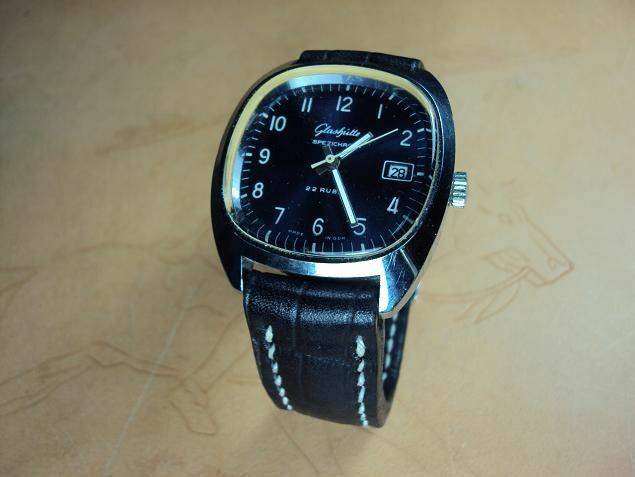 This Callaway CY-2085 vintage leather custom strap is price at $ 180 USD, now charges the promotional price at $120.00 USD. Shipping for worldwide Express Mail Service please plus extra $ 24 USD. 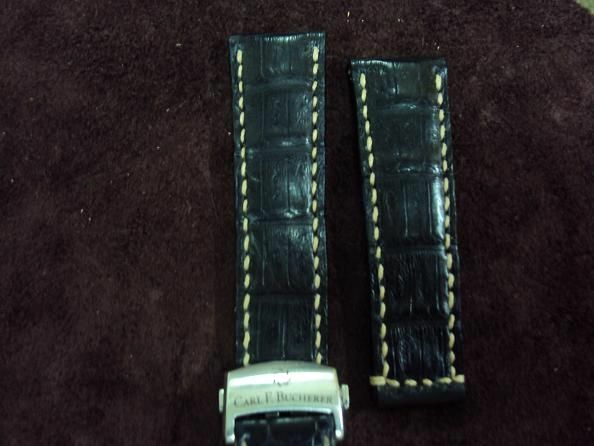 Svw256, Carl F. Bucherer deployant clasp padded black crocodile strap, 21x18mm, 75x115mm, thick 6.0mm taper to 2.1mm, cream stitch. Svw257, Cuetom deployant clasp golden padded crocodile strap, 26x20mm, 75x125mm, thick 6.5mm taper to 2.2mm, white stitch. 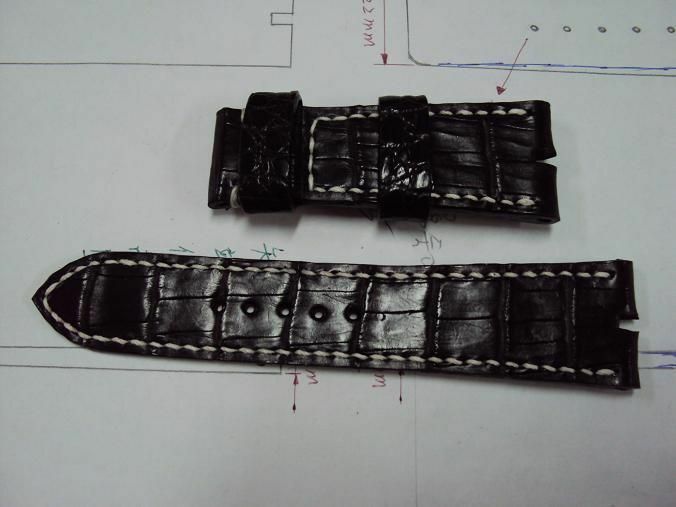 Svw259, Glashutte ultrasoft black crococalf leather strap, 20x20mm, 60x120mm, thick 6.5mm taper to 3.2mm, white stitch. The crococalf strap is priced at $ 130 USD, now charges the same promotional price at $ 80 USD including registered airmail worldwide shipping. 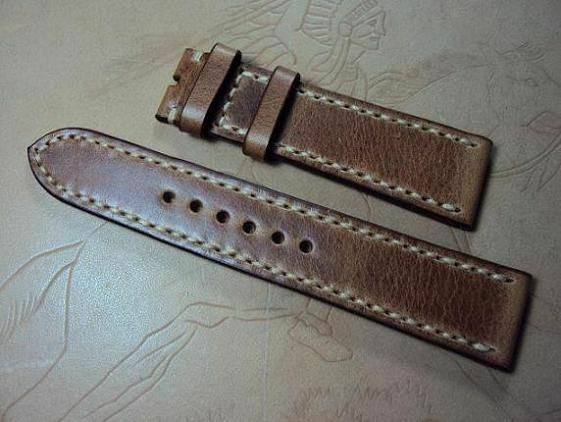 Svw260, Custom strap tan vintage leather strap, 22x20mm, 80x120mm, thick 3.7~3.5mm, cream stitch. 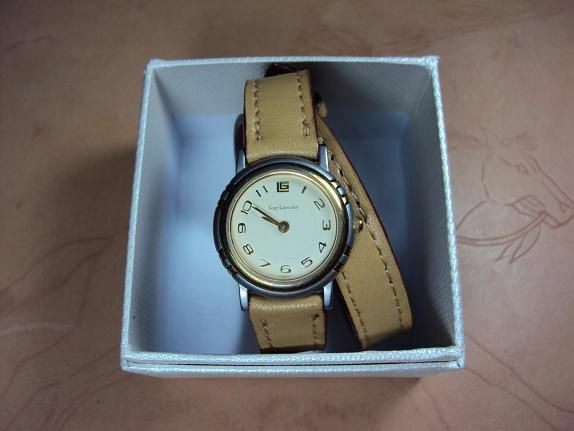 This tan vintage leather strap is priced at $ 130 USD, now charges the promotional price at $ 80 USD including registered airmail worldwide shipping. 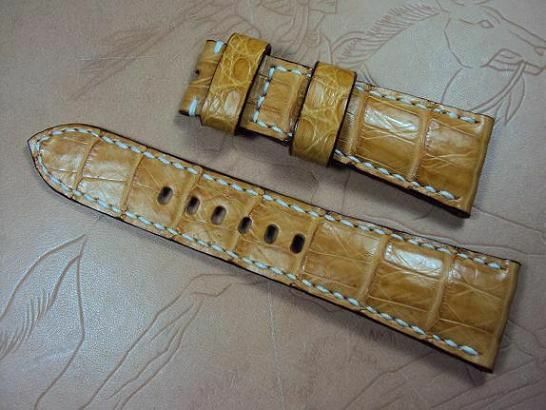 Svw261, Custom deployant clasp padded tan crocodile strap, 8(21)x18mm, 73x120mm, thick 5.0mm taper to 2.0mm, white stitch. 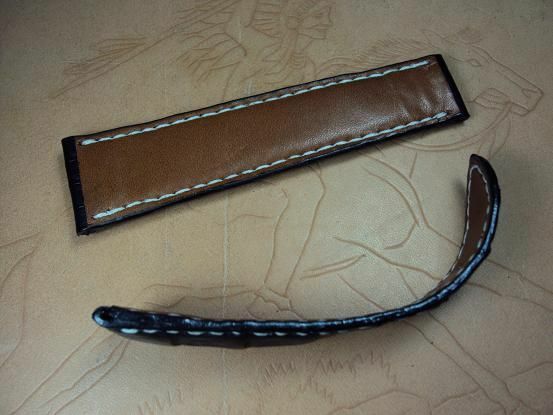 The thick 5.0mm would bear the heavy watch, and the thick 2.0mm at the tail of the strap would be flexible and comfortable. 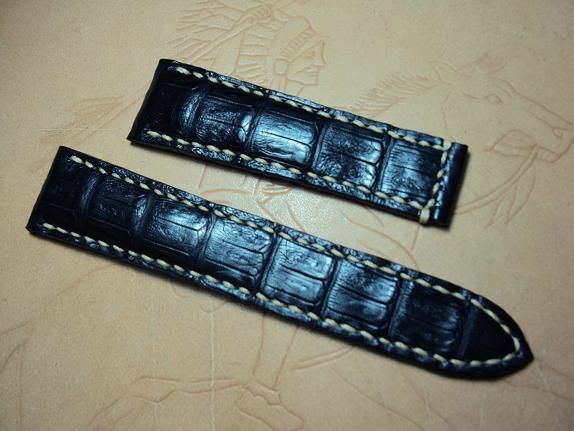 This padded deployant clasp crocodile strap is priced at $ 200 USD, now charges the promotional price at $ 150 USD. Shipping for worldwide Express Mail Service please plus extra $ 24 USD. 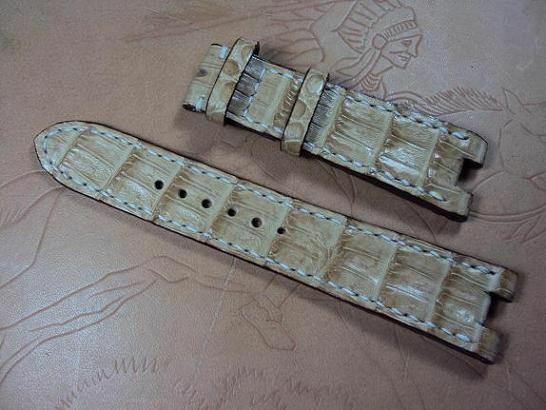 Svw262, Custom tan sheepskin twice length strap, 12x12mm, 70x270mm, thick 2.0mm, tan stitch. 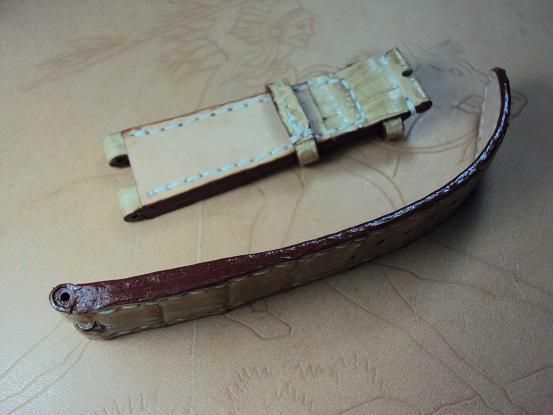 This sheepskin twice length custom strap is priced at $ 180 USD, now charges the promotional price at $ 130 USD. Shipping for worldwide Express Mail Service please plus extra $ 24 USD. 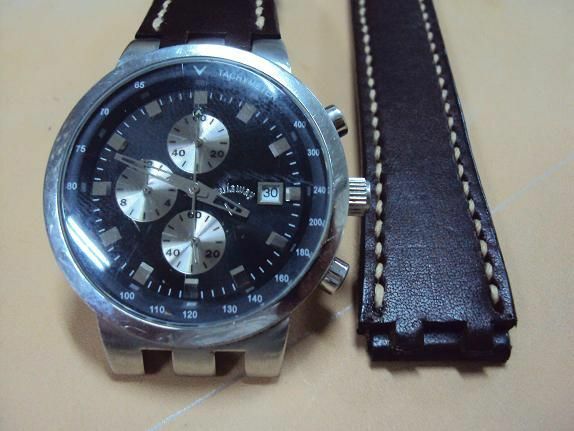 Svw263, IWC Big Enginieur Chronograph custom crocodile strap, 26x18mm, 70x115mm, black stitch. Therefore, our custom made IWC Ingenieur padded crocodile strap will be more durable, clean and anti-allergenic during the wearing period. 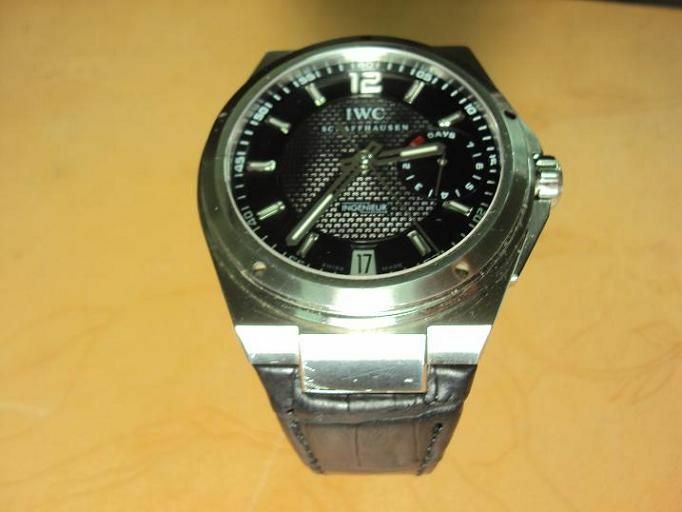 The IWC Big Ingenieur black crocodile strap is price at $ 400 USD, now charges the promotional price at $300.00 USD. No including the OEM IWC buckle. Shipping for worldwide Express Mail Service please plus extra $ 24 USD. 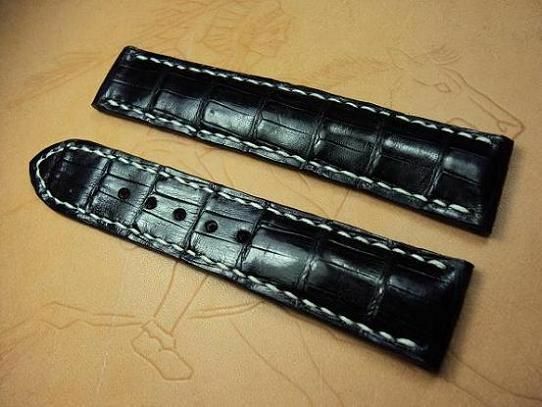 Svw264, IWC deployant clasp black crococalf strap, 20x18mm, 70x115mm, thick 5.5mm taper to 2.8mm, white stitch. 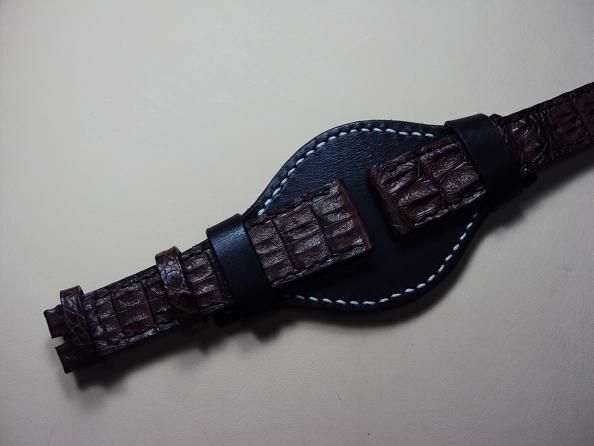 The crococalf custom strap is priced at $ 130 USD, now charges the same promotional price at $ 80 USD including registered airmail worldwide shipping. 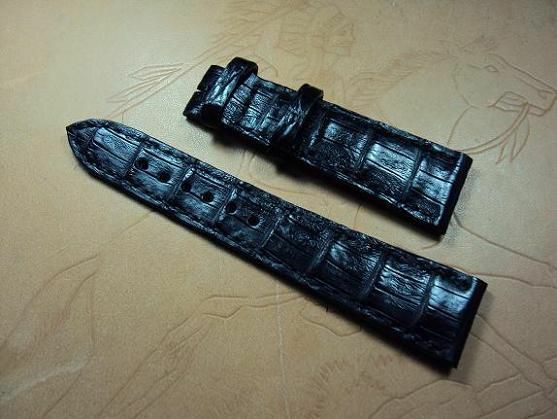 Svw265, LV deployant clasp strap, 16(24)x18mm, 68x120mm, thick 5.0mm taper to 2.2mm, hand carved cow skin strap, black stitch. Please notice that this LV custom deployant strap service is limited for sending me the LV old strap that has worn to produce the new custom strap. 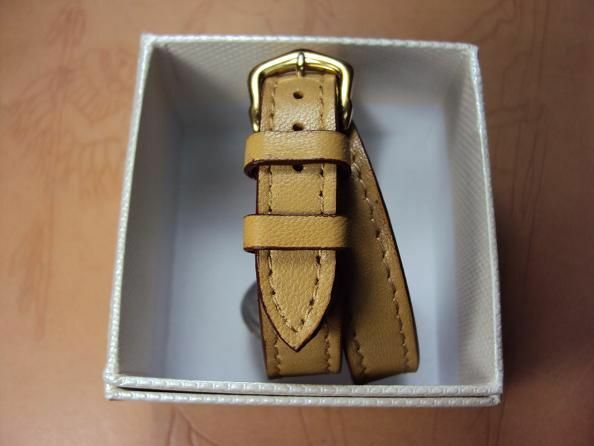 This LV deployant clasp strap is price at $ 190 USD, now charges the promotional price at $130.00 USD. Shipping for worldwide Express Mail Service please plus extra $ 24 USD. 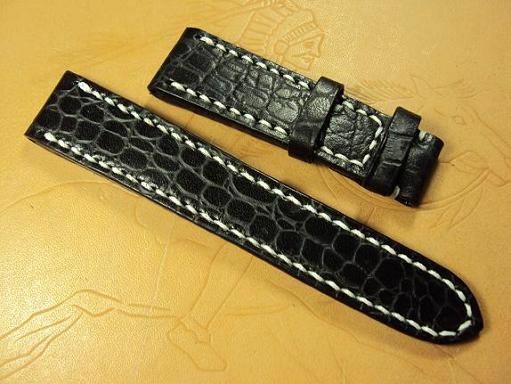 Svw266, OMEGA deployant clasp black padded crocodile strap, 21x18mm, 103x98mm, white stitch. 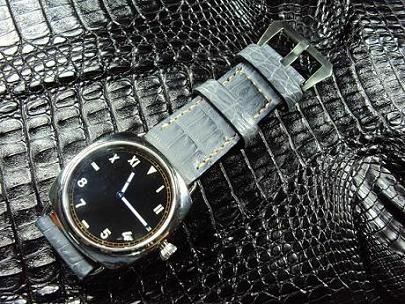 Svw267, OMEGA deployant clasp padded black crocodile strap, 24x18mm, 105x98mm, white stitch. Svw268, RXW Custom grayish blue crocodile strap, 27x26mm, 75x135mm, cream stitch. 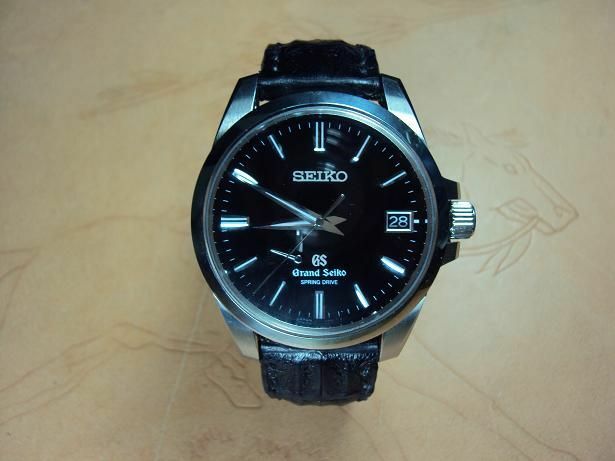 Svw269, SEIKO deployant clasp padded black little horn crocodile strap, 19x18mm, 62x110mm, black stitch.